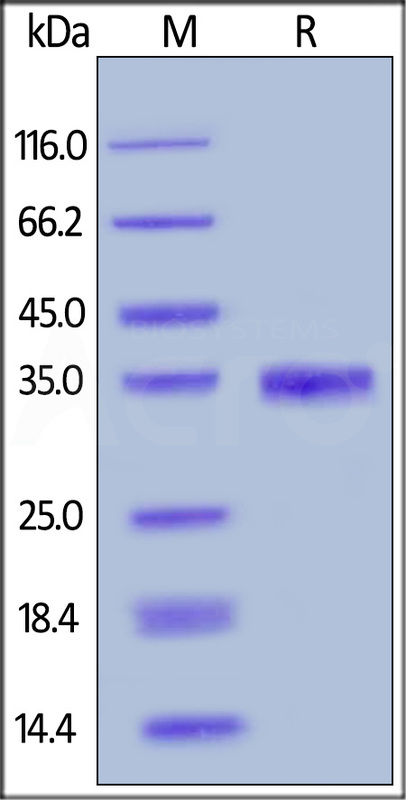 Human EGF, Mouse IgG2a Fc Tag (EGF-H525b) is expressed from human 293 cells (HEK293). It contains AA Asn 971 - Arg 1023 (Accession # P01133-1). The protein has a calculated MW of 33.1 kDa. The protein migrates as 35 kDa under reducing (R) condition (SDS-PAGE) due to glycosylation. Human EGF, Mouse IgG2a Fc Tag on SDS-PAGE under reducing (R) condition. The gel was stained overnight with Coomassie Blue. The purity of the protein is greater than 95%. Immobilized Human EGF R, Fc Tag (Cat. No. 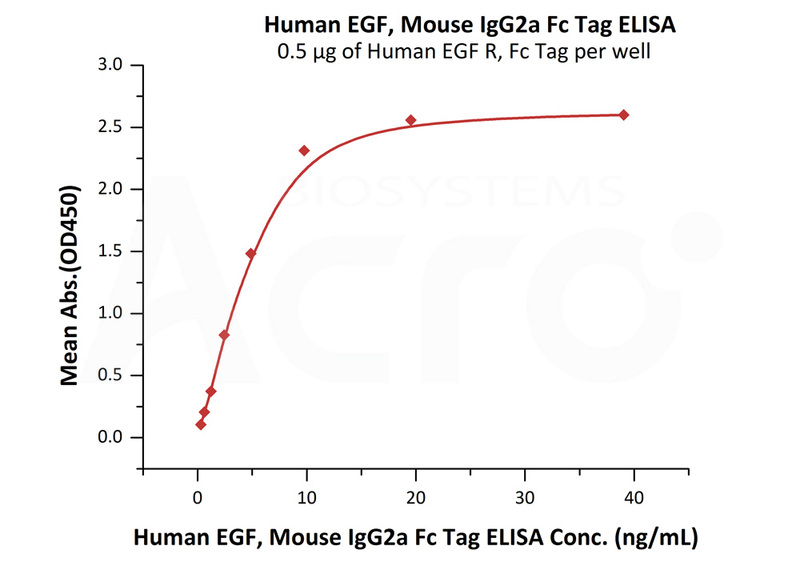 EGR-H5252) at 5 μg/mL (100 μL/well)can bind Human EGF, Mouse IgG2a Fc Tag (Cat. No. EGF-H525b) with a linear range of 0.3-10 ng/mL (QC tested). Human epidermal growth factor (EGF) is also known as HOMG4 and URG,and is a growth factor that plays an important role in the regulation of cell growth, proliferation, and differentiation by binding to its receptor EGFR. Epidermal growth factor can be found in human platelets, macrophages, urine, saliva, milk, and plasma. EGF is the founding member of the EGF-family of proteins. Members of this protein family have highly similar structural and functional characteristics. All family members contain one or more repeats of the conserved amino acid sequence. The biological effects of salivary EGF include healing of oral and gastroesophageal ulcers, inhibition of gastric acid secretion, stimulation of DNA synthesis as well as mucosal protection from intraluminal injurious factors such as gastric acid, bile acids, pepsin, and trypsin and to physical, chemical and bacterial agents. Because of the increased risk of cancer by EGF, inhibiting it decreases cancer risk. (1) Barnham KJ,et al. 1998, Protein Science 7 (8): 1738–49. (2) Cotran, Ramzi S.,et al. 2005, Robbins and Cotran pathologic basis of disease. (3) Dreux AC,et al. 2006, Atherosclerosis 186 (1): 38–53. (4) Venturi S,et al.2009, Nutrition and Health 20 (2): 119–134. (5) Herbst RS., 2004, Int J Radiat Oncol Biol Phys., 59(2 Suppl): 21-6.